Here we guide you through how to share an event with a touring company. Administrators and Standard users can both set up an event to be shared with a chosen touring company. The following details are required in order to proceed. Firstly, specify the date the share code will expire at midnight on. This gives the touring company a timeframe in which to download the data but it can be share again if they don't get the opportunity to download the data first time round. 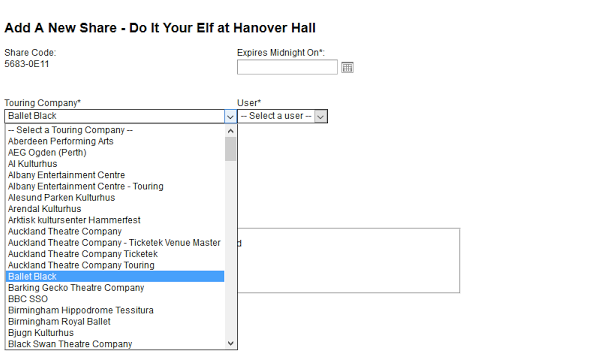 Next, specify the touring company and user that you wish to share this event with. The 'Touring Company' is a pre-populated database of organisations. 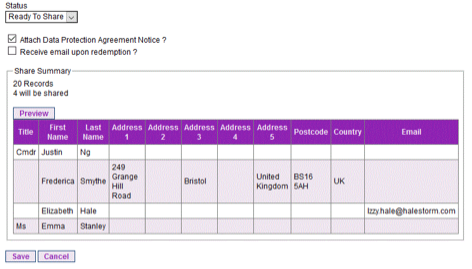 Choose the correct company name from the drop down options. The users will then populate for you to choose who are associated to this company. Next, choose the share status. ‘Ready to Share’ status ensures standard users can set up events ready for administrators to approve in advance of the event taking place. On this screen you can also click on Preview to view the data. 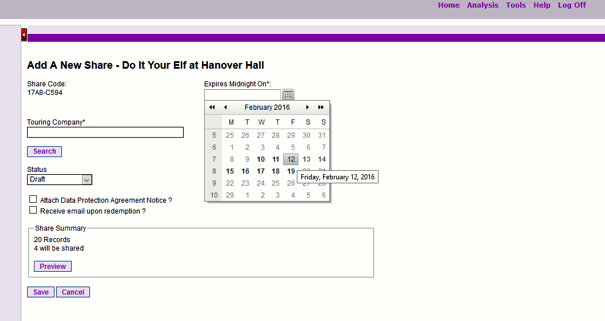 Once you have saved your share options for this event you can see the summary status listed on the event view page. You may have more than one share code for the following reasons.